Breaking Benjamin is an American rock band from Wilkes-Barre, Pennsylvania, consisting of Benjamin Burnley, Aaron Fink, Mark Klepaski and Chad Szeliga. The band has released four albums to date. Their music is most often classified as alternative rock, and post-grunge. 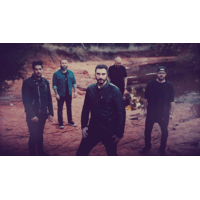 The group is currently on hiatus due to frontman Benjamin Burnley's recurring illnesses and is unable to tour for the time being.